We designed these free grid based home screen backgrounds and decided to call them Grid-Apps (Okay we know they are not Apps but the organise your Apps so were sticking with it, okay!) available for iPhone and iPad to coincide with the IOS4 software upgrade which allows you to select and image as a home screen background. 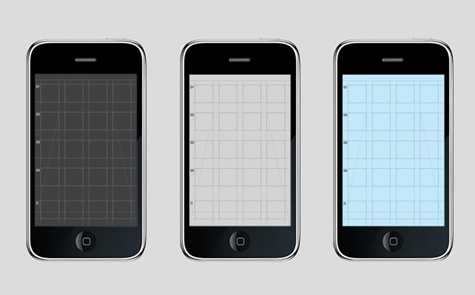 These grid inspired layouts act as an organised wireframe grid structure to keep your applications in neat and tidy order on your iPhone or iPad. With numbered grid rows and a ‘D’ for Dock you simply press hold and drag and drop your icons into the specific grid spots. Please note only works on devices running IOS4 and only on 3GS or iPhone 4. More colours and styles will be available soon. Click here for free download and installation instructions. iPad Grid-Apps will be available soon. When will the iPad version be available? This wallpaper looks great!